Within a week, I visited two taquerias in two American West Coast cities. Both specialize in delicious street style tacos, and both allow for a fast casual order/pay first and tacos are delivered by number to the table. Yet they each bore little resemblance to one another in all other areas. Which wins? Read on to find out which of these great taquerias has the edge. 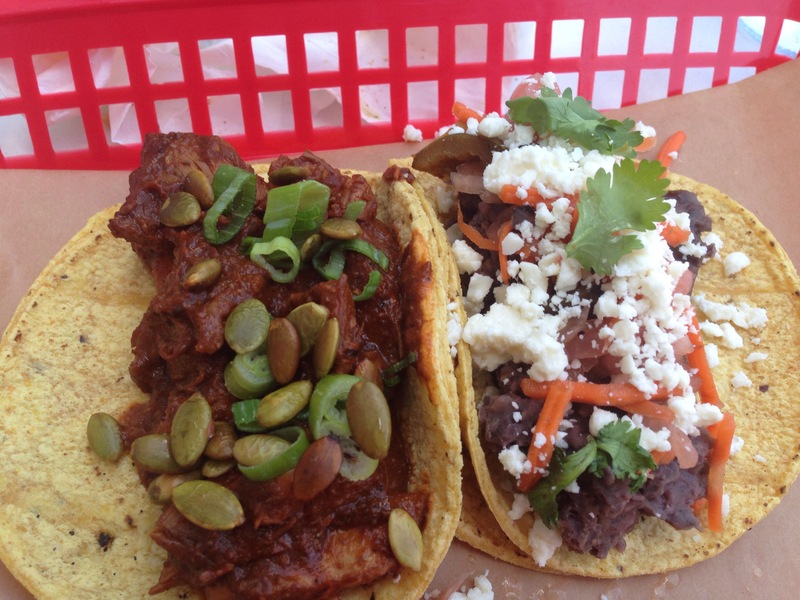 In my last post, I highlighted the “Austin style” street tacos of Portland’s Stella Taco. A clean, hipster taqueria in a hot neighborhood with friendly, laid back staff, its tacos definitely would not be described as traditional. Each taco is a work of art, scrupulously fabricated with interesting flavor combinations. Vegetarian and vegan options, too, are more inspired than your average Mexican-ish eatery. San Francisco’s Tropisueño puts the traditional Mex flavors and its urban yuppie Cali in CaliMex. Located just south of Market Street on the border of SoMA (South of Market) and the Financial District, it definitely attracts a large business crowd. Just remember that San Francisco defines business attire differently – a group of techies and bankers might look a bit less buttoned up. You might only know them from the other patrons by their company swag. Nonetheless, you have plenty of time to people watch as you wait in the often long lines. Tip: go off-peak to avoid the hassle, cramped seating, and ordering errors. Walk inside Tropisueño and you will feel the Northern California meets Mexico vibe. Ordering isn’t always the most organized, but watch the visible, nonstop assembly line, which is mostly female and of definite Mexican origin. It is culinary poetry in motion, and I hope they are decently compensated for that. The menu is more exhaustive of Mexican dishes than Stella Tacos, with quesadillas, burritos, and full entree platos with options for enchiladas, tostadas, and more. Tacos are fairly customizable. Regular tacos are simple – choose your meat (or vegetarian/vegan option) and it comes with onions and cilantro. You can still heap one – or more – of over six different salsas, as well as radishes, lime, and jalapeños at its salsa and chip station. Choose a super taco, and that adds lettuce, cheese, guacamole, beans, and crema to the regular 4″ taco. Fish tacos are separate options. I went simple with two regular tacos with a side scoop of guacamole (pictured in the featured image, top). My chicken tinga was amazing, so tender, juicy, and well seasoned. The carne asada was slightly bland in comparison to the chicken, but it certainly was not one to skip by any means. Both were delicious and did not require heaps of toppings. The salsas and a small amount of guac added just enough flavor to not overpower the meat. So which taqueria wins (and gives its city limited bragging rights until my next face off)? Honestly, I have to give Portland’s Stella Tacos an edge in this one, for freshness and attention to detail, which is a bit unfair since SF’s Tropisueño by far is the more popular and crowded of the two). Until next time….when I try the super taco!